Your home's gutters provide an important layer of defense against costly water damage, but only when properly cleaned and maintained. Located in Battle Ground, WA, Grant Roofing & Pressure Washing is pleased to serve satisfied clients through the Portland and Vancouver areas. Whether you need routine gutter maintenance or your gutters require repair, our licensed, bonded and insured team of skilled gutter repair and maintenance technicians can have your gutters in top shape in no time. Gutter cleaning is a necessity in the Pacific Northwest at least once or twice a year. Failing to clean your gutters will lead to clogs - and clogged gutters can actually cause roof leaks, as water will back up under the shingles to the substrate and leak into any seam that is in the path of least resistance. 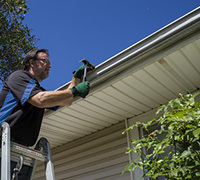 Leaky gutters are also a nuisance – they can cause slippery spots in high-traffic areas, landscape damage, roof leaks, window leaks and staining on your siding. We make sure all the debris is out of your gutters and your downspouts are draining properly. We will also provide a gutter tune up to make sure all your gutters are properly secured. We Pride Ourselves on Being Thorough! At Grant Roofing & Pressure Washing, our gutter cleaning team tailors our services to meet your particular needs. Whether you need routine maintenance to remove accumulated leaves and debris or your gutters require snaking or flushing with pressurized water in order to remove more serious clogs, our skilled technicians can finish the job quickly and thoroughly. 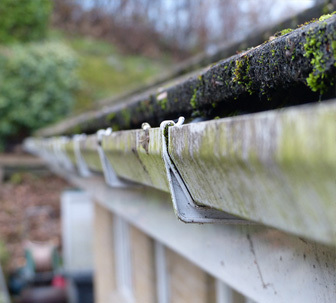 As part of every cleaning, our team will closely inspect your gutters to ensure that there are no underlying issues that require further attention or repairing. Many homeowners are unaware of how essential their gutters are for safeguarding their homes, but in truth, well-functioning gutters help defend your roof, foundation and home's interior from devastating water damage. By allowing water to drain away from your home, your gutters and downspouts protect your foundation's structure from the corrosive and destabilizing effects of accumulated water. A well-maintained gutter system also prevents water from seeping into your home, causing unsightly water damage to your walls and ceilings that can foster the growth of dangerous mold. Similarly, your roof's shingles are subject to costly damage from debris or leaves that build up in your gutters over time. In short, gutters that are serviced regularly and kept in good condition are one of your home's best defenses against water damage. Hiring an experienced and skilled gutter repair team can help protect your home against the need for costly repairs due to poor water drainage. If your gutters are displaying signs that they need repair such as sagging, pulling away from the roof, or other visible damage - or if your gutter system is simply old and worn out - Grant Roofing & Pressure Washing can help. Our team has all the required parts and tools to carry out needed repairs and restore your gutters to their optimal condition. If your gutters prove to be too damaged to repair correctly, Grant Roofing & Pressure Washing has the capability to perform a completely new gutter installation. Whatever your cleaning needs may be, Grants has you covered! Contact us today to schedule a free and gutter inspection where we can discuss your needs.